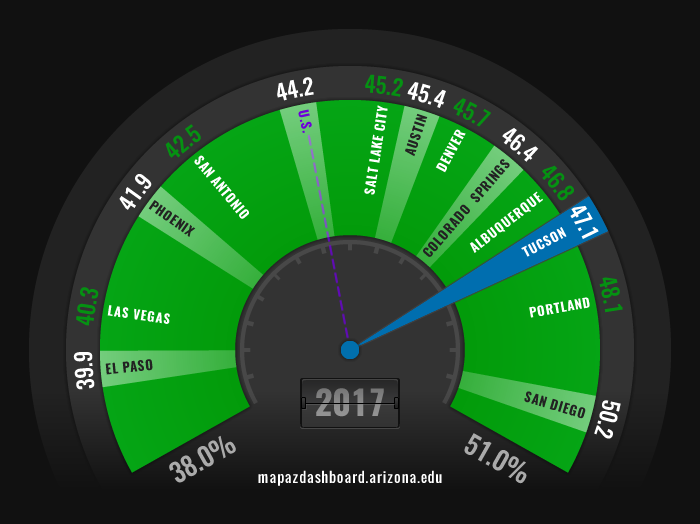 In 2017, 47.1% of college graduates in the Tucson Metropolitan Statistical Area (MSA) reported a science and engineering or related field as their college major. This ranked Tucson third out of 12 western MSAs. The San Diego MSA led with a rate of 50.2%, and the El Paso MSA placed last with 39.9%. Science and engineering or related fields accounted for the largest share of college majors in Tucson, the state of Arizona, and the U.S. in 2017. Arts, humanities and other degrees formed the second largest share in Tucson, while business ranked third. The share of majors in science and engineering or related fields was higher among non-Hispanic graduates than it was among Hispanic graduates in Tucson, Arizona, and the U.S. Tucson had a larger gap in science and engineering or related fields by ethnicity than did Arizona or the U.S. Choice of college major can have a profound impact on employability and earning potential throughout the course of one’s career. The distribution of college majors in a region can also effect location decisions of firms eager to capitalize on a talented and diverse workforce. Recent reports have found higher rates of full-time, year-round employment among science and engineering or related majors, as well as business majors in comparison to those who majored in education or arts, humanities and other fields. Science and engineering and business majors also reported higher median wages, and were employed in a wide range of industries. Projected job growth in science and engineering or related fields highlights the importance of monitoring college major, as well as the need to close gaps in science and engineering or related degree attainment by ethnicity. In 2017, the Tucson MSA had a higher percentage of science and engineering graduates (37.7%) than Arizona (33.0%), or the U.S. (34.8%). This major also comprised the largest share of bachelor’s degrees in all three geographies. In Tucson, bachelor’s degrees in arts, humanities, and other accounted for the second largest share, while business degrees ranked third. Bachelor’s degrees in education was fourth, while science and engineering related, a field that includes para-medical and technician professions, accounted for the smallest share. The share of science and engineering or related majors was 42.0% among Hispanic graduates, and 48.0% among non-Hispanic graduates in the Tucson MSA. This generated a gap of 6.0 percentage points in Tucson. Arizona and the U.S. also had higher rates of science and engineering majors among non-Hispanic than Hispanic graduates, yet their attainment gaps by ethnicity were lower, at 2.9 and 1.3 percentage points, respectively. Data on the distribution of college majors are from the U.S. Census Bureau American Community Survey (ACS) five-year estimates. ACS began collecting data on field of degree in 2009, and reports information for five degree categories: science and engineering, science and engineering related, business, education and arts, humanities and other fields. The universe for data on field of degree is individuals over 25 years of age with a bachelor’s degree. Science and engineering includes computer, mathematical, physical and social sciences. Science and engineering related includes engineering and medical technology fields such as medical and engineering technicians, physical therapists and other science and engineering support fields. These two major fields have been combined in figures one and three.